Black Wrinkle Finish Spray Paint. 12 oz can. 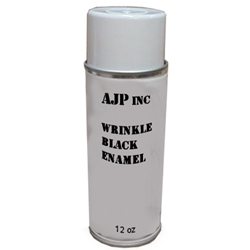 Black Wrinkle Enamel Spray paint. There are several black wrinkles available on the market today but most do not give the correct vintage look found on the Voltage Regulators from WWII. We have found this paint looks very much like the original. ONLY SHIPS GROUND SO DON'T CHOOSE PRIORITY MAIL! If you choose USPS ground there is no tracking or insurance and will take up to 2 weeks.